Zen like in simplicity and complexity alike, the egg possesses the most potent powers in the kitchen universe. This mild mannered, retro- looking, carrying case houses a dynamic duo of culinary superheroes, the yolk and the white. Both amazing in their own right, put them together and you've just got plain dynamite. But, do we really tap this wellspring of goodness? Do we use all the blades on this edible Swiss Army Knife capable of changing mere liquids into custard, of leaping tall soufflé dishes in a single breath? Or have we even forgotten the simple pleasures of a perfect plate of scrambled? Join us for an investigation we call, The Egg-Files. 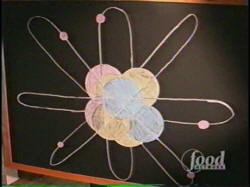 We're going to pursue a higher understanding of this ubiquitous ovoid. We're going to evaluate the hardware and implement the procedures necessary to ensure it's proper cooking. Stick around because in here [the egg], good eats. "The chicken," it's been said, "is just an egg's way of making more eggs." And since she can grind out one about every twenty five hours, the female Gallous here could be considered an egg factory, no rooster necessary. And since she's a cumulative layer as along as someone keeps taking 'em, she'll keep making 'em: 365 days a year, no Lamaze, no epidural. Now that's dedication! Sorry, I get a little carried away. Now, the egg's sophisticated design stems from its intended function as both food and shelter. In the center, the yolk, pure in nourishment, high in fat, minerals, vitamins. It's got it all. The white provides physical support and bacterial protection as well as salts, protein and liquid. The shell, a tough yet porous suit of armor capable of supporting the most matronly of hens. Now, sophisticated though it may be, the egg just doesn't hop out of the chicken and into a carton. 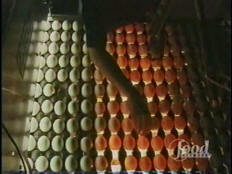 At processing plants like this one eggs are bathed, sanitized, dried and then candled. It used to be a prospective buyer would hold an egg up to a candle or some other flame and take a look at what was going on inside. A trained eye can always spot anomalies like blood spots or over large air sacs or even hairline fractures. Stuff like that. Today, computers do most of the work but it still takes a trained human eye to spot certain problems. 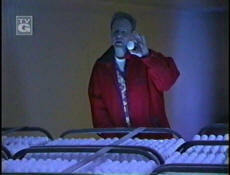 The eggs that do pass the scrutiny of man and machine pass over a jet of air that actually weighs them and then the computer sends them off their respective containers. Now, egg grading is a voluntary process. But just because it's voluntary, doesn't mean that it's free. It isn't. As a matter of fact, processors pay big bucks for the United States Government to come in and do the grading for them. This is Inspector Sullens of the United States Department of Agriculture. HAROLD SULLENS: What I do is just a hand technique of ... I'm spinning the interior so that I can detect any defects inside the egg. AB: So, what are the different grades of eggs? HS: There is Double-A eggs, A-Grade eggs and B-Grade eggs. AB: So, what's the difference between, say, a Double-A and an A? HS: Double-A eggs are your freshest eggs. The white is more firm, stands up when broken out. The yolk is rounder. AB: They're perkier. Ha, ha. It's a perky egg. So, what's the difference between a Double-A and an A? HS: Mainly, it's age. A-Grade is just a little older. AB: So, I guess somebody could by a Double-A egg, take it home, let it sit in the refrigerator for a few weeks and it would age into an A, right? AB: What about a B-Grade egg? HS: That's the yolk. And the reason you see the yolk that plain is because the white has broken down. AB: So, when you put that out into your pan or onto a plate it's just going to run out all over the place. 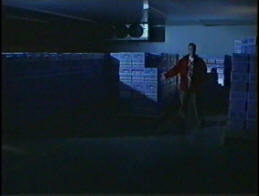 HS: It's going to run out. A dozen large eggs weighs from 24 to 26 ounces. A room temperature egg ages more in one day than a refrigerated egg ages in a week. So, keeping this box at or a little below 40° will help what's in this box stay fresher longer. But don't keep your eggs in those little 'sloty' things in the door. The door spends too much time wagging around in hot kitchen air and shelf bins, like the one that come with your refrigerator, promote drying and breakage. 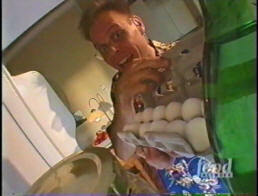 So, keep fresh eggs in their own carton. It's designed to hold them. And, keep it towards the back of the shelf. Oh, if you plan to hard cook your eggs, take the carton, put a rubber band around it and keep it on its side for at least 12 hours. That way, the yolk will stay centered in the white instead of settling off to the side. Once upon a time, eggs were considered germ-free zones. Purity in a shell. I mean, Rocky drank like a glass load and got what, a dozen sequels? But ever since that gastrointestinal bad boy, salmonella, skunked its way into the hen house we've all become deathly afraid of an undercooked egg be it in mayonnaise, hollandaise, a soft boiled egg or, well, eggs over-easy. Heck, most restaurants won't even serve eggs over-easy anymore, too much liability. And when they do, well, let's just say we're working from a whole different culinary dictionary. 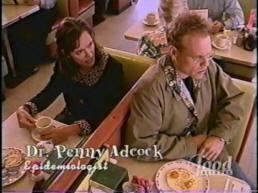 AB: [eyes lady in next booth] You're some kind of food cop, aren't ya? PA: I'm an epidemiologist. How'd you know? AB: Yeah, you've got that look. You probably work for some shadowy governmental agency. PA: Well, the CDC is not really shadowy. AB: Yeah, okay. So what's with eggs? 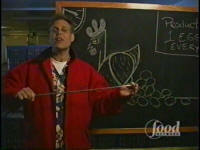 PA: A few years ago, salmonella figured out how to get into the chicken's reproductive system. AB: Ahh, this sounds like some kind twisted conspiracy. Let's talk odds. PA: We figure that about 1-in-10[,000] to 1-in-20,000 are infected internally with salmonella. AB: So, basically I run about the same risk of getting sick from properly handled eggs as I would, say, getting bitten by a rabid squirrel in downtown Detroit? AB: So, we're talking 165 here. PA: We prefer to say 170 to 175. AB: That's enough to turn a yolk into a hard little rubber ball. How many outbreaks do you see from home cooking, though? PA: Well, most of our problems come from food service operations. AB: So, what's your advice? AB: You expect life to still be worth living. Okay. Thanks, doc. Of course, now the new irradiation systems are promising the heroic return of the salmonella free egg to a grocery store near you. It only seems right to preserve the legacy of the properly eased-over egg. It all starts with a small, non-stick skillet over low heat, a little pat of butter and we'll let that melt. Now, you could use some other fat, I admit, but in this case the fat's not really there to prevent sticking. The pan can do that by itself. In this case it's really there for flavor and the flavor of butter just naturally goes with the flavor of egg. 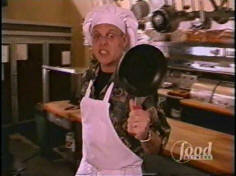 The only other tool you want to have hitting this pan is a spatula, rubber spatula. If you get one with a red handle it usually means that it's heat proof which is the right thing for this pan. Never metal, never anything abrasive on this pan, ever, or it will do you wrong. As soon as you see the butter start to foam get your eggs ready, the fresher the better. Just crack them right into the pan. And here's a little trick: tilt the pan, just lift the handle about an inch off of the cook top and just hold it there for a moment until the outer white starts to set. These are nice fresh eggs. You can tell by looking at them because the yolks are standing up so nice and tall. I'm just starting to get some bubbles around the edges so I'm going to go ahead and ease the handle back. Moving around the pan just a little bit at this point is good because some of those bubbles that are slowly forming under the white are going to want to get out and if you don't jiggle the pan a little to work them off to the edge they'll come straight up through the middle, torn white, ugly egg, game over. Now is a good time to go ahead and season. Eggs need salt. So, I'm just going to sprinkle a little bit of fine sea salt. I don't use kosher salt on these kind of eggs. And I also like to use a pepper that's a very fine grind because I don't want to bite into any big chunkies. This may be simple but it isn't rustic. And I'm really wanting to flip these but I'm going to fight the urge because I see that the thicker white has not started to set yet. Be patient. 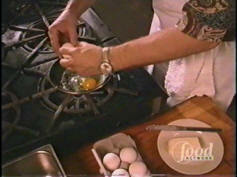 All in all it's g oing to take at least a minute to a minute and a half to gently cook the egg on this side. After that, things are going to happen really fast. Okay, here comes the flip. Now, this is really a lot easier than it looks, I promise. The secret, believe it or not, fresh eggs. The fresher the eggs the stronger the membrane that's surrounding the yolk which means it's going to have more resilience when it lands upside down. Now, down on the heat and count to ten. One. Two. Three. Four. Five. Six. Seven. Eight. Nine. Ten. And the reverse flip. You see, the secret is to pop your wrist, get it airborne and then bring the pan up to meet the egg, and then off immediately onto the plate. AB: Want to see a trick? AB: Okay, but just this once. One is cooked, the other is raw. SOC: Give me back my hat. Egg number 1. We spin. We stop. We release. Egg number 2. We spin. We stop. An egg shell is over 90% calcium carbonate. It's as strong as bone. Eggs can stick to cookware with a mysterious and ferocious force, but foods high in protein usually do. You can fight back with a good non-stick skillet. Gone are the days of temperamental Teflon. Today's non-stick coatings are high tech marvels, tough and wicked slick. But, don't judge a pan by it's coating alone. Successful egg cookery depends on heat control so beware of cheap pans that can warp or have hot spots or may not even be flat in the first place. 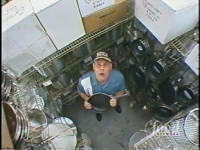 Avoid spending a bundle by shopping at your local restaurant supply house. 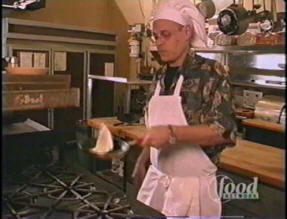 Teflon, an American invention, was first applied to a pan by a Frenchman. For my money, the ultimate marriage of yolk and albumin can be found in the culinary alchemy of scrambled eggs, a dish whose magic lies in the mysterious do-si-do of the proteins, fats, emulsifiers, salts and water that is the egg. Now, there's no mystery to producing great fluffy plates of scrambled but there is more to it than crack-and-stir. Start by melting a couple of teaspoons of butter over medium-low heat. Now since our new pan is of the non-stick variety, we don't need a lot of fat. We do need a little. It's not so much to prevent sticking but to promote flavor. Now as for the egg-cracking itself, don't do it on the edge of a cup or of a bowl. That will only punch wee little bits of shell into the egg which is nasty. Do your cracking on the counter or even better onto a plate that can be easily be whisked away later for washing. Now, eggs can be cooked straight up just fine. But, you're going to get higher volume and a lot nicer texture if you add a little liquid. I like whole milk although you could use something as light as water or as heavy as cream. Whatever you do don't add more than a tablespoon per egg. Now I've got 3 eggs here and 3 tablespoons of milk. Mix well but don't beat them to death. Eggs don't appreciate violence. Come to think of it, they don't much care for salt either. Long exposure to salt can toughen the final dish so just stir in a pinch or two of salt right before the eggs go into the pan. And as for pepper, wait for the table. Now I like to scramble over two different temperatures. I start them real low just stirring until they just begin to coagulate or form curds. 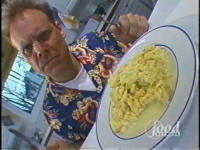 Now, most scrambled eggs go wrong not because of too high a heat but because they spend too much time over high heat. Because they are mostly protein, eggs coagulate when they cook forming a kind of 3-D mesh that traps moisture. 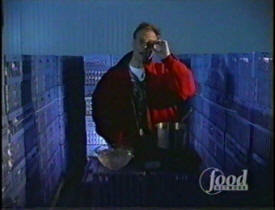 But over high heat, these proteins squeeze so tight that they'll wring the moisture out of an egg just like a sponge. If you've ever been served a plate of scrambled eggs that floated like an island in a plate of water, well, all of that water should have been in the eggs. Okay. There. You see the curds have formed so now we're going to bring the heat up all the way to high. But don't worry if you don't have gas. This will work on electric, too. You're just going to take a little bit longer, that's all. Now, keep the pan moving and try not to stir too much. Think about folding the curds over each other. The whole point here is to increase volume by allowing the moisture inside the eggs to convert to steam which will lighten up the whole dish. Just fold and shake. Now, as soon as there isn't any more liquid running around the pan retreat from the heat. Now, I know that looks underdone right now but believe me, move it around a little bit and by the time you get it to the plate and the plate to the table you'll have a perfectly cooked set of scrambled eggs. And this leads us to the cardinal rule of egg scrambling: if it looks cooked in the pan it will be over cooked on the plate. Believe me. You can't get around it. 1945 was America's egg eating year with 402 consumed per capita. The white from the yolk is like splitting the atom. You unleash some pretty amazing cosmic powers. 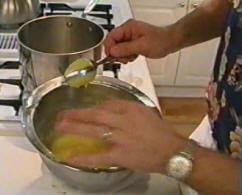 See, the yolk has the ability to capture and hold on to liquids as it cooks turning them into the gel we call custard. Now, a custard based on citrus juice—like, say, lemon juice—is usually called a curd. And not only is lemon curd shamelessly easy to make it may actually be the most the most versatile substance on earth besides maybe duct tape. You can spread it on bread, biscuits, cake, you can bake it into lemon squares, fold it into soufflés, you name it. If you only know how to make one dessert item you might think about making it lemon curd. Here's what you'll need. The hardware: a medium sized stainless-steel pan, a stainless-steel or copper bowl capable of fitting inside said pan without coming too close to the bottom, a whisk and a grater. More on this [grater] later. Now, the software: enough water to come about 1 inch up the side of the sauce pan, 4 lemons, a stick of butter cut in to about 8 or 9 pieces, 5 egg yolks and one cup of sugar. Add the water to the pan and bring up the heat to medium. We're just going to bring this to a simmer. All of the flavor—well, at least 95% flavor of the lemon—is on the very outer layer of skin. It's called the zest and it's full of oils as opposed to the acid that you find in the juice. So we need to get that off of there but we don't want to go very deep because beneath here be dragons. It's called the pith and it tastes, well, dreadful. You could use a peeler, if you had a really good one, to just bring off the outer surface but then you'd have to chop it up. You could also use a bar grater which would get down to the zest and would bring it off in these long strings which would probably get caught in your teeth so you've got to chop them up, too. The last choice, and my favorite, is a custom wood rasp that you can get a hardware store. These things take off just the perfect amount of zest as you can see it kind of piling up right there. 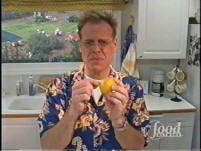 Now, we've got our zest of 4 lemons we're going to add the juice of two of those lemons and if the lemons don't come up with too much juice for you, you might want to add enough water to them to get you up to a third of a cup. Now, goes the sugar and 1, 2, 3, 4, 5 egg yolks. Next, your whisk. You're going to want to work this until it's pretty smooth and you don't see too much of the grain of the sugar. It's going to take about 4 minutes depending on how much work you put into it. Now, once the water has come to a simmer, turn it all the way down, put the bowl over the pan and keep whisking and don't stop whisking. Now, whether they bake in the oven or on the stove top custards are all about temperature control. There's only a few degrees of difference between a satiny custard and sweet and scrambled eggs. Using a double-boiler is like taking out curd insurance. See, the steam completely covers the bottom of the bowl so the heat is consistent and even and there are a lot of sugar molecules in there and that will help the egg proteins from massing together. So, you don't have to beat your arm off but if you stop completely you're going to end up with a scrambled eggs. What once was a gooey pile of raw eggs and sugar is now a custard thick enough to coat the back of a spoon almost like a batter. The French call that napper and that means we are ready for the butter. I'm convinced that adding the butter after the custard has cooked makes for a smoother curd. Besides, adding it at the end cools it down which means I can eat it sooner. Work it in just a piece or two at a time making sure that each addition melts before the next one goes in. The custard is going to start to take on a tantalizing new car shine. Because of its sugar and acid content, lemon curd is pretty stable stuff. And if you can keep your spoon out of it, it will last for up to a month in the refrigerator. Now, to keep a skin from forming on the top of it you can just take a piece of cellophane or plastic wrap and push right down on top of it. It's the same trick that keeps guacamole from browning. Now when it comes to the serving possibilities, lemon curd is like a set of vice grips, there's nothing it can't do. You can fill a pre-baked pie shell or tart shell, you can spread it on a ginger bread like the Scots do and my favorite just happens to be on a nice little piece of pound cake with maybe a nice berry on it. Lemon curd. 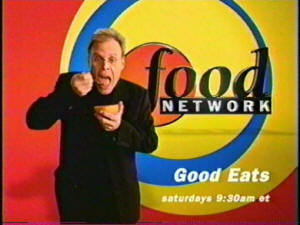 Powerful Ju-Ju and definitely good eats. Poet Laureate Ralph Waldo Emerson wrote, "There's always a best way of doing everything, even if it be to boil an egg." Now, if Emerson walked it the way he talked it he would have certainly have known that the secret to boiling an egg is to not really boil it at all. He would have started his eggs in just a bit of cold water adding a teaspoon of salt to help seal any possible cracking. I'm certain that he brought them just to a boil and then he removed them from the heat, put on the lid and then left them alone for exactly 15 minutes. Then, he would have drained them, maybe banging them around the pan to start the cracking, he would have finished them up in an ice water bath to stop the cooking which would prevent rubbery whites and black tinged yolks. Needless to say, prompt peeling followed. Now, Emerson, obvious hard-cooked fan that he was, certainly would have known that the more cracks in the shell the easier the peeling goes. Smart guy that Emerson. Now, we've only crossed the threshold into the egg universe. 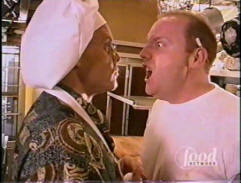 Emulsified sauces, soufflés, meringues, omelets, they're all still out there, watching, waiting. Should keep us busy for at least 6 or 7 seasons. But in the mean time, we hope you know posses a few more megabytes of egg knowledge than you did, say, half an hour ago. Join us next time when we once again journey into the far flung corners of the kitchen and return with some really good eats.